When something tickles you just right, you laugh. 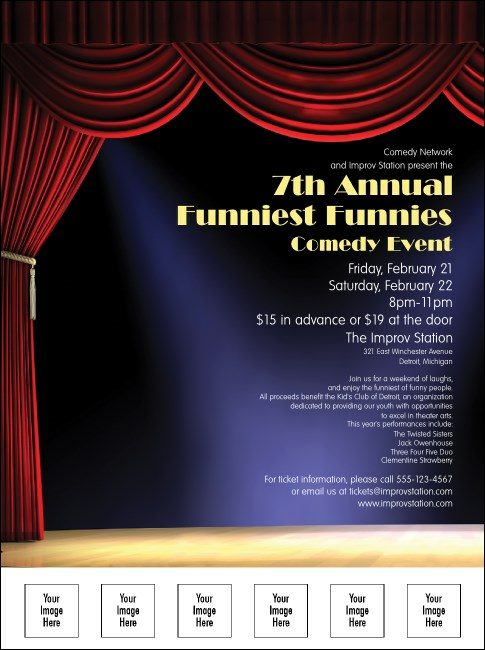 Share that amazing sensation with your next stand up comedy event and publicize it with the Stand Up Comedy Flyer, part of the matching Event Kit. Featuring a spotlit stage and space to upload six custom images of comedians or event sponsors on the template, the Stand Up Comedy Event Kit helps keep the laughs coming. Knock 'em dead with the right Event Kit from TicketPrinting.com.